GLASGOW, Scotland (Alba Orbital PR) — Alba Orbital Ltd (PocketQube Shop) announced today the addition of the DHV Technology PocketQube Solar Panel product to its online satellite shop. 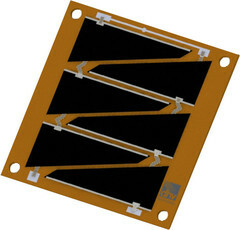 The Solar Panels are the first off the shelf power subsystem to be developed for the new PocketQube Standard. The PocketQube Solar panels are available in a number of configuration including 1p, 2p and 3p. They leverage flight heritage gained from the Unisat-6 Microsatellite which launched earlier this year using DHV Solar panels. Panels can be tailored to different structures on request.